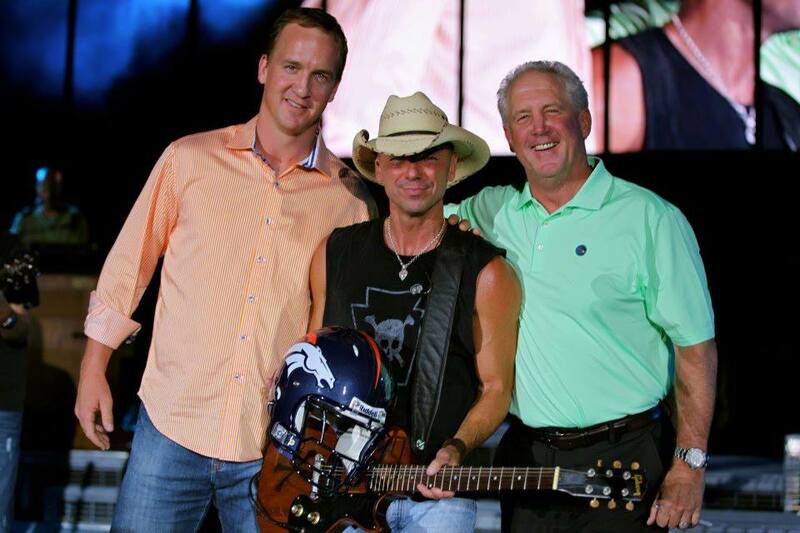 We are 20 days away until Kenny Chesney is back at Sports Authority Field at Mile High. Make sure you don't miss it! Last Saturday of every month at Tooey's Off Colfax! 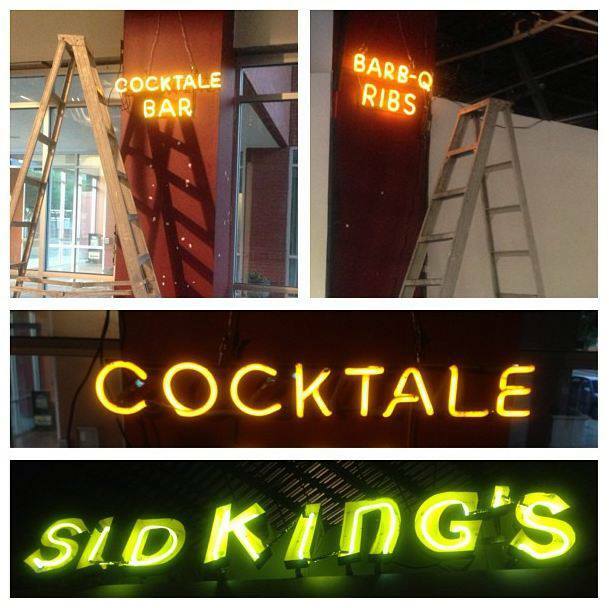 Check out the Sid King's sign at the Collection Art Gallery this Saturday! Also check out the night opening for the neon art exhibit at The Collection Art Gallery on July 20th starting at 7pm. The Collection is located at 9801 East Colfax across the street from the Aurora Fox Theater. 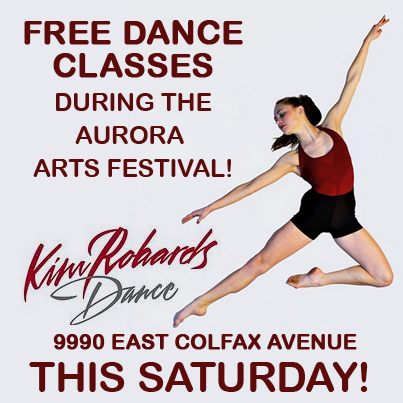 Aurora Arts Festival This Saturday!! 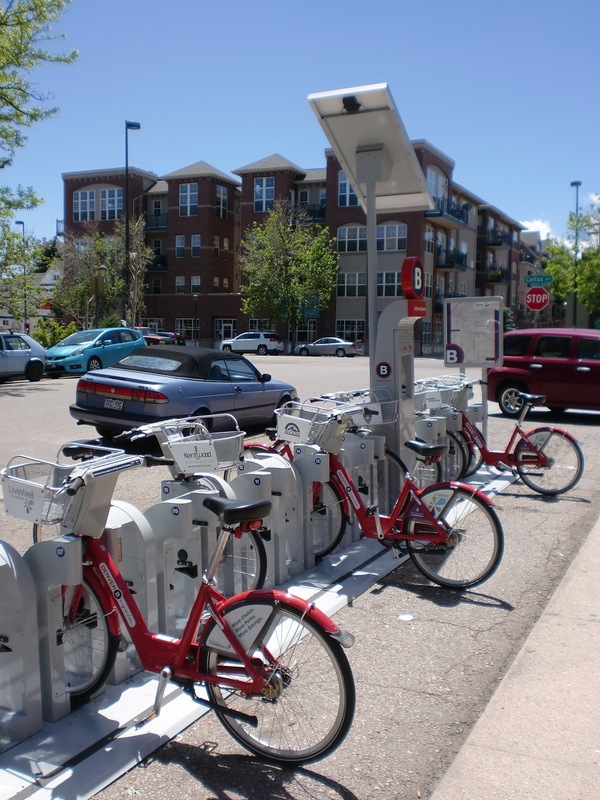 Come PLAY in the Aurora Arts and Cultural District! 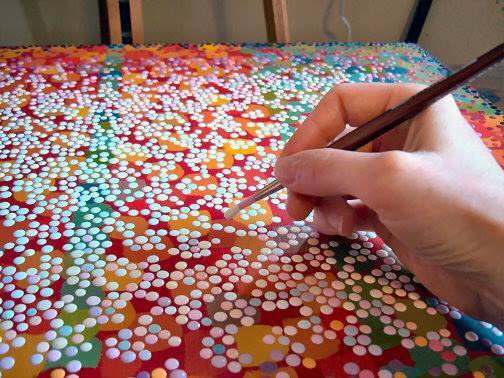 Each Summer the Aurora Cultural Arts District puts on an arts focused event for the City of Aurora and neighboring communities. This year the event will be held this Saturday, June 29th from Noon-5pm. This year’s theme is PLAY! The district welcomes its neighbors to get to know the art district right in their own backyard. 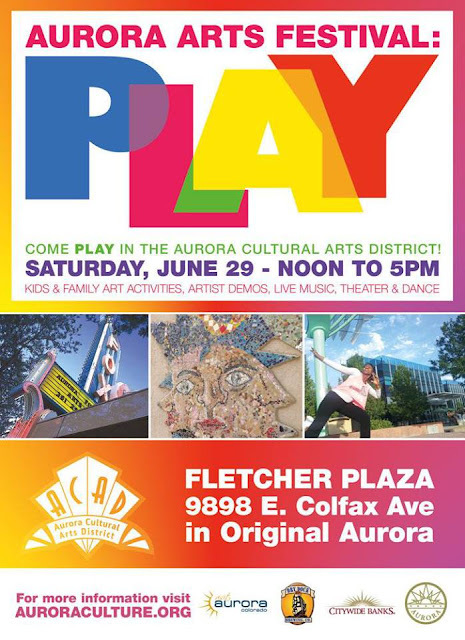 Hosted in Fletcher Plaza (9898 E. Colfax) this event is geared towards kids and families and will focus on the PLAYful environment that art creates. “Our goal is to engage the neighborhood and introduce them to what the art district can offer and the events we support,” says new Managing Director, Tracy Weil. Over 50 Local artist demonstrations and booths, PLAY with Interactive art & craft activities for kids and families, sponsored by DAVA (Downtown Aurora Visual Arts), ACAD Artists, The Athena Project & Trash as Art. Live painting, chalk and mural artists! Appearances by characters from The Hobbit, courtesy of the Aurora Fox. Original Aurora Renewal will be debuting their new “Masking Tape Masterpieces” series where you can make your own master piece using colored masking tape. Special mini PLAYS and performances hosted by the Ignite Theatre and the Vintage Theater. Live Music PLAYed by Local Musicians on the Fletcher Plaza stage including music by the Aurora Symphony, Banyan Tree, Gora Gora Orkestar and more! PLAYful Gallery Tour: District Galleries and Creative businesses will be open, giving the public opportunities to view the current exhibitions in the district. Locations include The Collection, The Blue Chair Garden, DAVA, 1400 Dallas and Red Delicious Press. Download & Print the Program/Map! 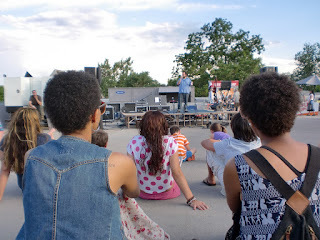 The Aurora Culture Arts District (ACAD) is an independent non-profit organization leading local creative businesses, individuals, and the local business community and area residents, partnering with the City of Aurora and other entities in efforts to enhance the district as a destination through cultural and educational experiences. In just 50 days, Bud Light Music First’s summer-long celebration of music will culminate with “50/50/1,” a never-before-seen music event featuring one concert in every state on a single day including Phillip Phillips at the Fillmore Auditorium in Denver. The unique structure of 50/50/1 brings a stage to each state to create the first truly national music festival. Additionally, Bud Light will live stream select performances on the Bud Light Music First Myspace hub. Phillip Phillips released his debut album The World From The Side Of The Moon (19 Entertainment/Interscope Records) in November where is debuted at #4 on Billboard’s Top 200 chart and has already reached gold status. 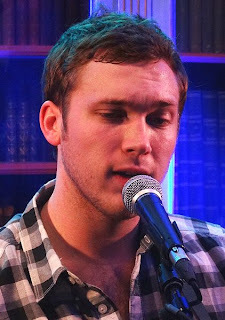 His debut single “Home” topped the charts and Phillip will release his second single “Gone Gone Gone” this month. Several years later, Phillips formed an acoustic band with his sister and brother-in-law and added singing to his repertoire. After graduating high school, Phillips began studying industrial systems technology at Albany Technical College in Georgia and continued playing music with his brother-in-law. With encouragement from his family and friends, Phillips took a break from working in his family’s pawn shop and auditioned for American Idol in summer 2011—and soon found himself tearing through powerful, full-throated performances of songs by artists like Creedence Clearwater Revival, Otis Redding, and Wilson Pickett on the Idol stage. TICKETS WENT ON SALE SATURDAY, JUNE 15 @ 10:00 AM at the Fillmore Auditorium Box Office, online at www.ticketmaster.com or call 800 – 745 - 3000 Tickets are 25.00 GA ADV and $30.00 GA DOS plus applicable service charges. The Fillmore box office is open Monday - Friday from 12:00 Noon - 6:00pm & Saturdays from 10:00am - 2:00pm. On days of Fillmore shows, the box office is open from 12:00 Noon – 9:00pm. So, you want to sweat profusely and do yoga at the same time in a 105 degree heated room with deep jungle humidity? You better like heat if you're interested in taking a class at the Mile High Bikram Yoga/College of India (Denver's ONLY Certified Bikram Yoga School), a relatively new business started by David Hebert (a professional skydiver, aerial photograph + contractor) and Samantha Trang Phung (a massage/natural health therapist with a BA in Business Administration from Georgia State University). In a remodeled storefront at 5019 East Colfax Avenue, you'll find a roomy studio carpeted in tweedy beige with brown stripes. Beginners and experts both gather in these classes with their yoga mats, towels, water bottles (which items can be rented so newcomers don't have to invest in anything right away), and loose clothing. Classes are, according to one student, "very welcoming and integrated in every way: age, race, economics, gender, etc. 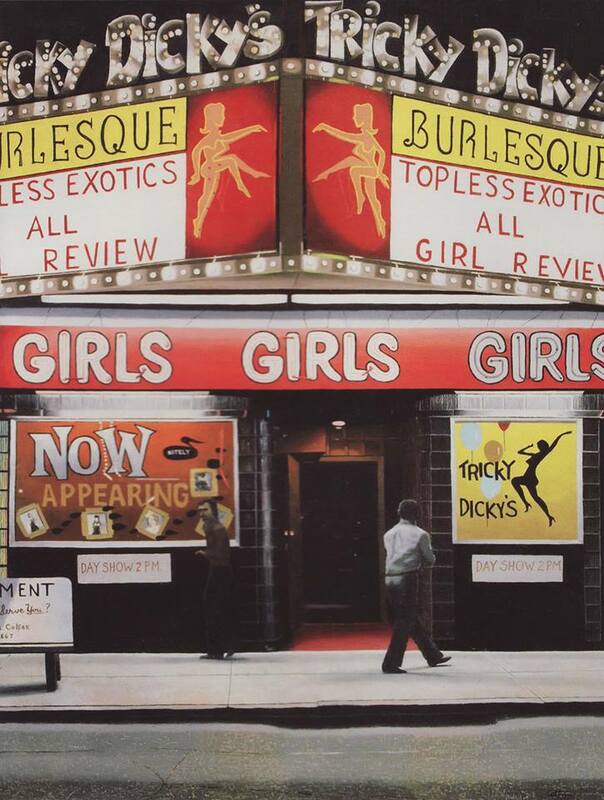 They're aerobic, strenuous, lovely, friendly and peaceful." The simple decor of the establishment has been inspired by the stark wood decor of a Swedish sauna with walls painted in gradations of yellow to deep gold earth tones. Try one week of unlimited yoga for $20 as a new student (90 minutes classes), and visit their website for further information on times and prices. 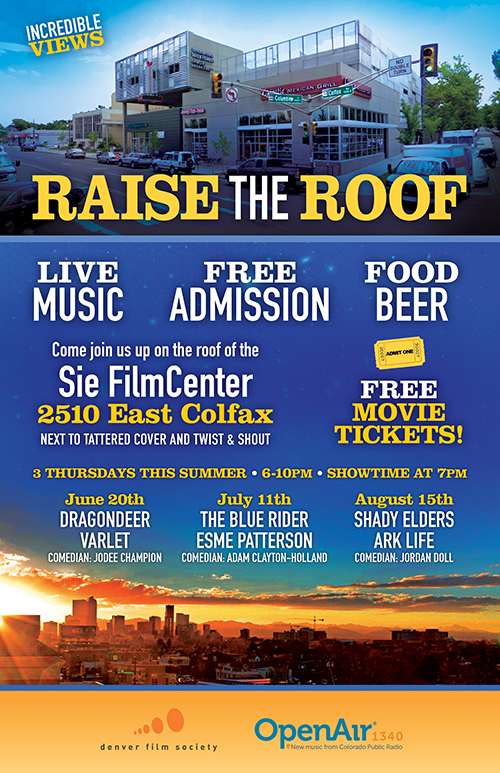 The Denver Film Society is sponsoring three free neighborhood block parties on June 20, July 11 and August 15 from 6-10pm. on the roof of the Sie FilmCenter, which is next to Tattered Cover and Twist & Shout. Returning for a second summer season, the RAISE THE ROOF neighborhood celebrations feature free live music and entertainment along with local food, drinks and one of the best views of Denver’s skyline and the Rocky Mountains as seen from the roof of the Sie FilmCenter. 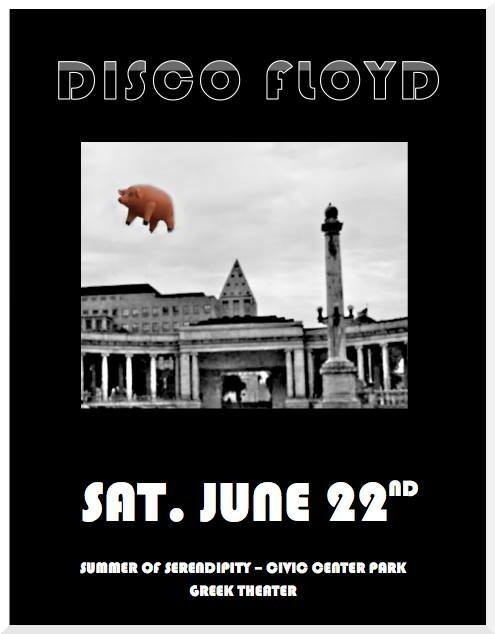 · June 20 – Dragondeer, Varlet, and comedian Jodee Champion. The CulturePlex rooftop will open at 6pm, with music beginning at 7pm. Attendees will be given a buy–one get-one movie ticket on the evening of the party to return for a film on a future day at the Sie FilmCenter. 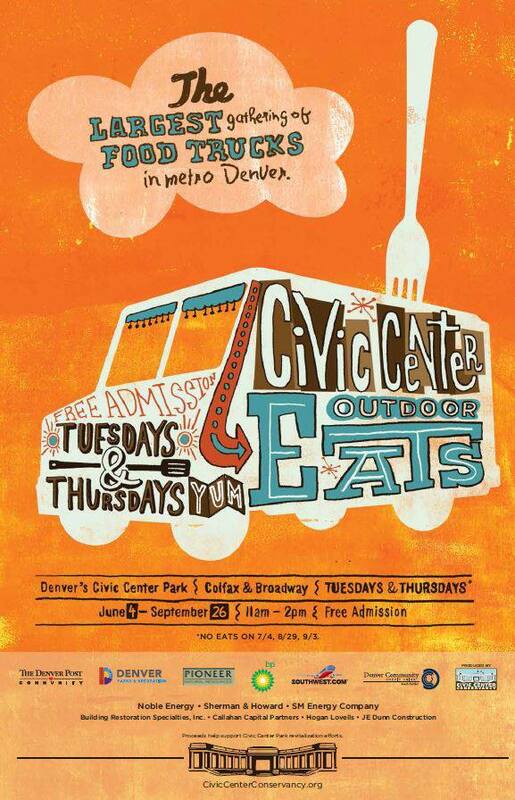 Restaurants from the Colfax corridor with be selling food and sweets. Local comedian and co-creator of Mile High Sci-Fi, Harrison Rains, will emcee all three events. Uhl Studios is excited to announce the release of David Uhl’s latest masterpiece, “Chance Encounter”. 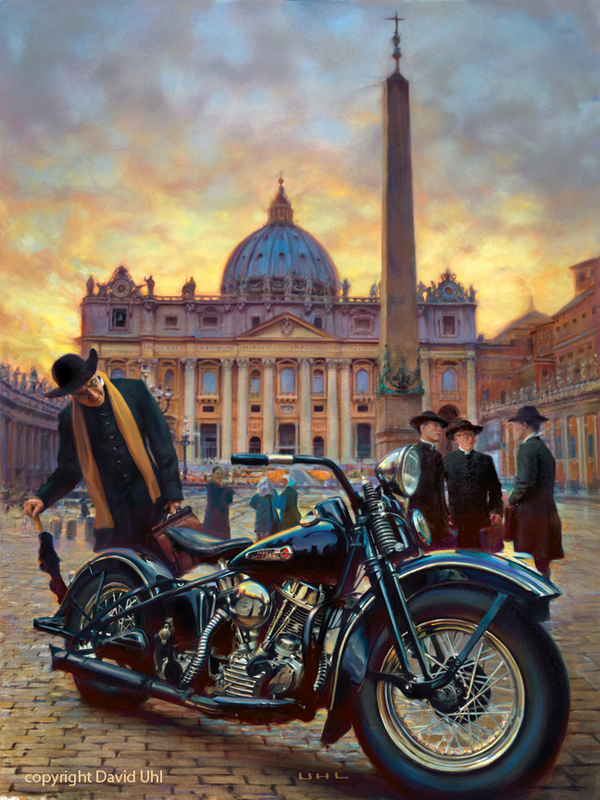 This stunning piece was commissioned by Harley-Davidson Europe for a special project with The Vatican during The Motor Company’s 110th celebration in Rome. David’s depiction of a Vatican official curiously inspecting a 1948 Harley-Davidson FL “Panhead” will adorn 50,000 Vatican postcards and Fine Art prints are now available in three sizes. 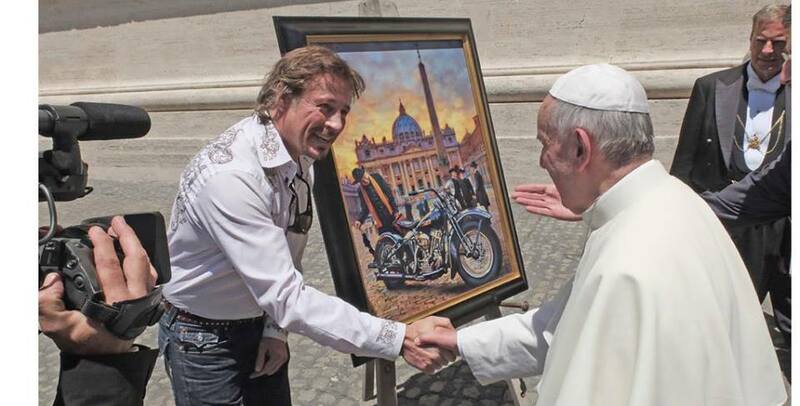 Last Sunday, 35,000 bikers who descended on Rome to celebrate Harley-Davidson’s 110th anniversary were blessed by Pope Francis during the Mass on St. Peter’s Square. 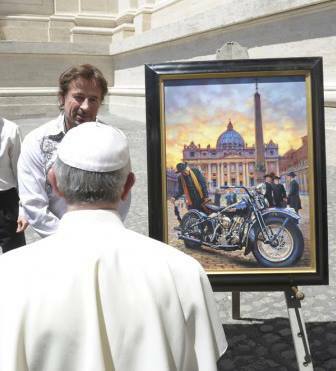 800 lucky winners were allowed to park their bikes on the road leading to St. Peter’s Square. David personally presented the new painting to Pope Francis! 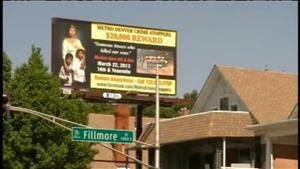 A Denver, Colorado mother is hoping a billboard will help find the hit-and-run driver that killed her children. 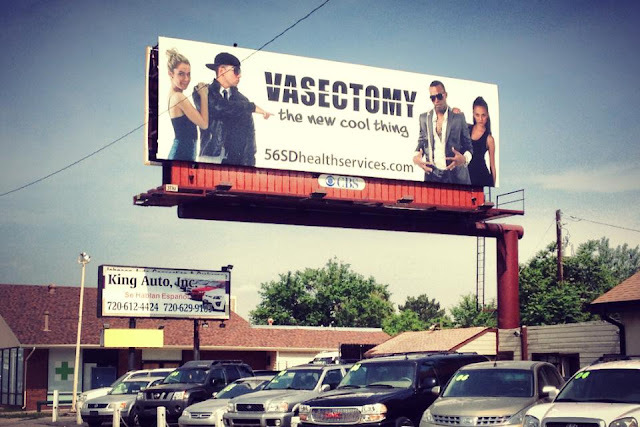 Metro Denver Crime Stoppers have unveiled a billboard on the corner of Colfax Avenue and Fillmore Street hoping to make sure people do not forget about the incident. The billboard is to keep Zama Bee - the mother of two children killed during a hit-and-run crash on March 22 at the corner of East 14th Avenue and Yosemite Street - at the top of everyone's minds in hopes the driver during the wreck will be brought to justice. The new campaign is called "Somebody Knows Something." Metro Denver Crime Stoppers has received a generous/sizable donation for this "Special Award" which will allow the organization to reward up to $20,000 for information which leads to an arrest and conviction. Bee and her 8-year-old son Zamay Khan and her 6-year-old Azat Khan were walking home from school when police say a Cadillac SUV hit them and did not stop. Police do not have any leads to go on, and that is why the campaign is so important. Athena Project envisions a world in which women’s voices are powerfully expressed and fully integrated into the creative life of every community. Athena Project’s mission is to empower women and strengthen the Denver community through developing and showcasing women’s and girls’ artistic contributions, while inviting new audiences into the creative process. Visit our website for more information www.athenaprojectfestival.org. Featuring the original cast and starring Russell Costen and Adrienne Martin-Fullwood, Tell Martha Not to Moan by Clinnesha D. Sibley is about the 40th Commemoration of the Detroit Riot. A series of memories unfold in a family home in Detroit, 2007, and takes us on a unique and personal journey with a devoted but desolate elderly couple. With compelling dialogue and complex relationships, Tell Martha Not to Moan is a glimpse into the changing world as viewed from an African American home and was the 1st World Premiere of Athena Project’s 2013 Arts Festival. It will be playing at the Fox Studio Theater July 5-21, Thursdays, Fridays, and Saturdays at 8pm, Sundays at 2pm. Tickets are $22 for adults, $20 for Students/Seniors/Military Discount, and $18 for groups of 8 or more. 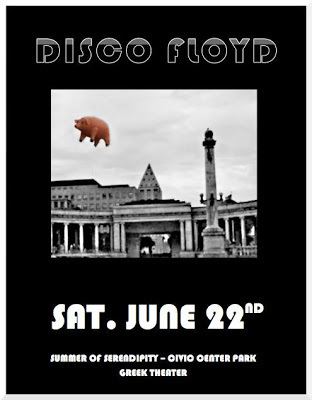 You may purchase tickets online at www.athenaprojectfestival.org or contact the box office at 303-739-1970. Founder & Executive Producer Angela Astle says, "We just can't leave the Patterson’s alone. Our 3 week run during the Athena Project Arts Festival 2013 was an overwhelming success. Many audience members wanted to bring friends and family back to see the show. 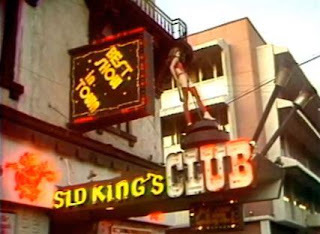 So we've decided to remount it, exactly as it was before, at The Fox. 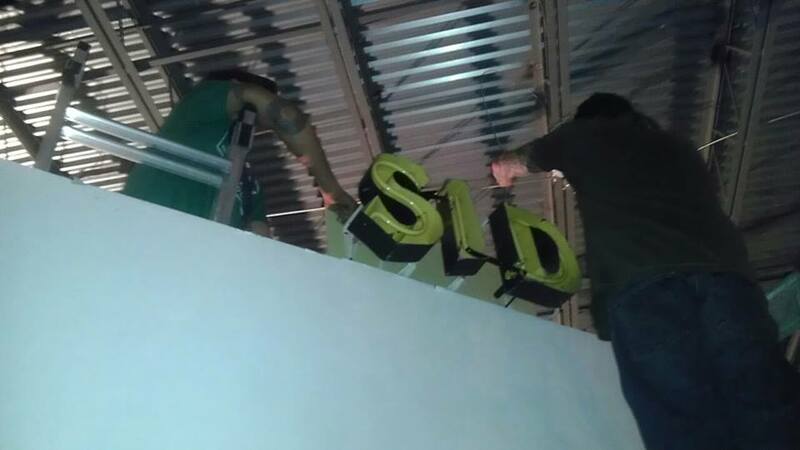 In addition, as our annual fundraiser, we decided to do what we know how to do best. Put on a play." Clinnesha D. Sibley is a published poet and award-winning playwright from McComb, Mississippi. Her plays have been presented for the Arkansas Repertory Theatre’s Voices at the River Playwriting Residency, NYCPlaywrights Play of the Month Series, D.C. Black Theatre Festival, TheatreSquared’s Arkansas New Play Festival, Kennedy Center American College Theatre Festival and Penumbra Theatre’s highly acclaimed Word(s)PLAY! Program. In 2009, she received the Key Woman Educator in Drama Award from the Iota Chapter of Delta Kappa Gamma Society. 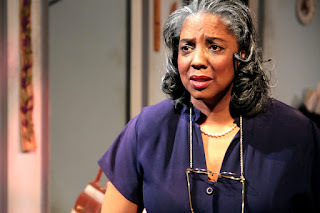 In 2011,her play, Tell Martha Not to Moan, received the Holland New Voices Award at the Great Plains Theatre Conference, was a semifinalist in the 2012 Eugene O’Neill National Playwrights Conference. Her short play, Bound by Blood, is published in Black Magnolias Literary Journal 6.2. Clinnesha is an Assistant Professor of Drama at the University of Arkansas in Fayetteville. 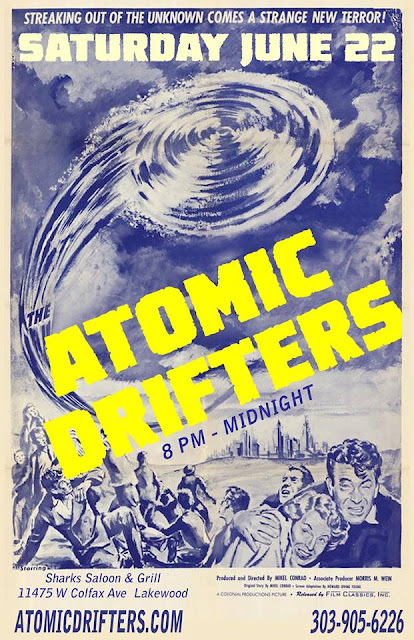 Thurs/Fri/Sat at 8 p.m.; Sun. at 2 p.m.
JOHN FOGERTY’s new album WROTE A SONG FOR EVERYONE has entered the Billboard Top 200 Albums Chart at #3, selling 51,319 copies in its first week. This marks the Grammy Award-winning Rock and Roll Hall of Fame inductee’s highest-debuting album of his career (including Creedence Clearwater Revival releases). In addition, this is Fogerty’s highest charting record since 1985's Centerfield hit #1. 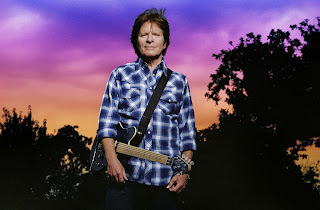 One of rock’s most important artists and a national treasure who’s sold over 100 million albums, FOGERTY has also announced preliminary tour dates for the fall (see dates below). A celebration of FOGERTY’s iconic songbook, the album is a collection of 14 songs: 12 classics and deep tracks (Creedence Clearwater Revival and solo material) from his remarkable canon of hits recorded in collaboration with today’s biggest superstars from the country, pop and rock worlds, plus two brand new solo songs including the new single and video “Mystic Highway.” WROTE A SONG FOR EVERYONE was released by Vanguard Records on May 28, FOGERTY’s birthday, when he performed a sold-out, intimate one-night-only album release and birthday bash concert at the El Rey Theatre in Los Angeles that was broadcast live on AXS TV and also simulcast on legendary radio station KLOS (95.5fm in Los Angeles). On the concert front, JOHN FOGERTY will be rockin’ all over the world in 2013 and 2014. The preliminary tour dates are below, with more to come soon. 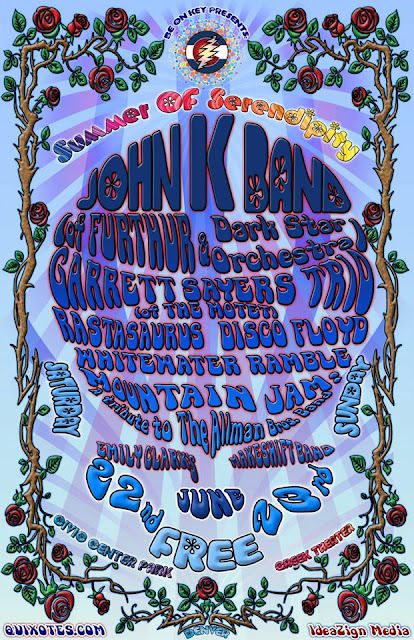 In addition, FOGERTY has two festival sit-ins with Widespread Panic and Zac Brown Band. WROTE A SONG FOR EVERYONE marks the singer, songwriter and guitarist’s ninth studio solo album since disbanding Creedence Clearwater Revival. Mixed by Bob Clearmountain, it was recorded in Los Angeles and Nashville except for "Proud Mary" which was recorded in New Orleans with Allen Toussaint and the Rebirth Brass Band. FOGERTY recorded “Fortunate Son” with Foo Fighters at their 606 studio using "the" legendary Neve recording console featured in the #1 iTunes documentary Sound City. "Fogerty and Foo Fighters muscle their way through the strafing guitar riffs of ‘Fortunate Son,’ he and Urban anticipate the joys of an impending weekend in ‘Almost Saturday Night.’ He meets the Zac Brown Band halfway between his own classic swamp rock and their Southern boogie groove for a bouncy revision of ‘Bad Moon Rising,’ and delves into the latent spirituality of the stately title track with Miranda Lambert, for which Fogerty delegated guitar solo duties to Rage Against the Machine/the Nightwatchman guitarist Tom Morello." Tickets are $49.50 GA plus applicable service charges. 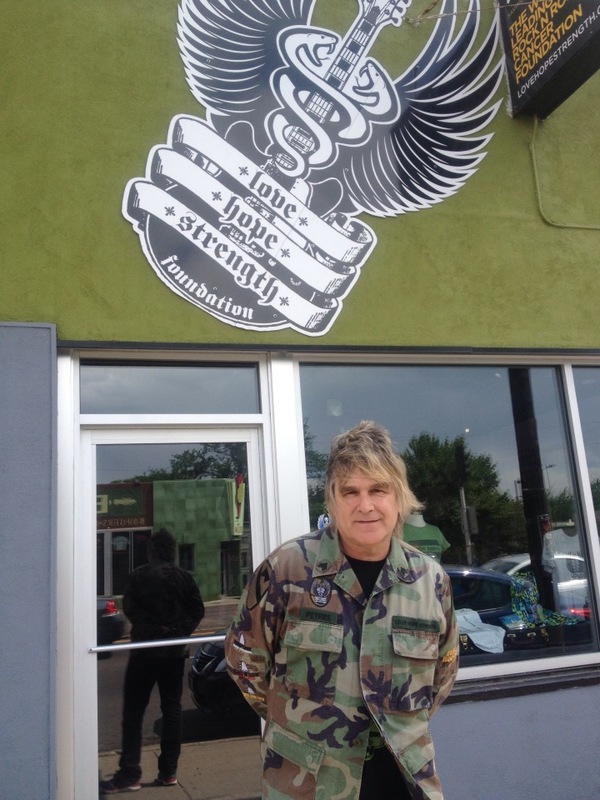 Mike Peters of The Alarm/ Big Country and co-founder of Love Hope Strength was at their Denver office (4956 Colfax Avenue, Denver, CO, 80220) today. Catch him tonight at Marquis Theatre and tomorrow at Vail Rocks 2013! Too cool!!! The man who wrote the surf guitar anthem "Walk, Don't Run" has died. Guitarist Johnny Smith died Tuesday night at his Colorado home of natural causes. He would have been 91 years old on June 25. 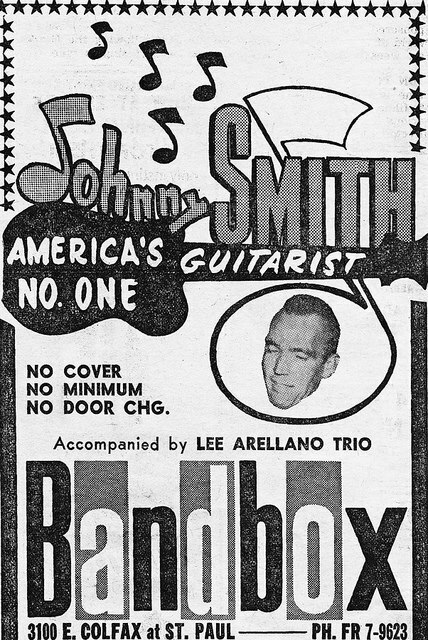 Here is a flyer from one of his gigs on Colfax Avenue back in the day. R.I.P. Johnny! 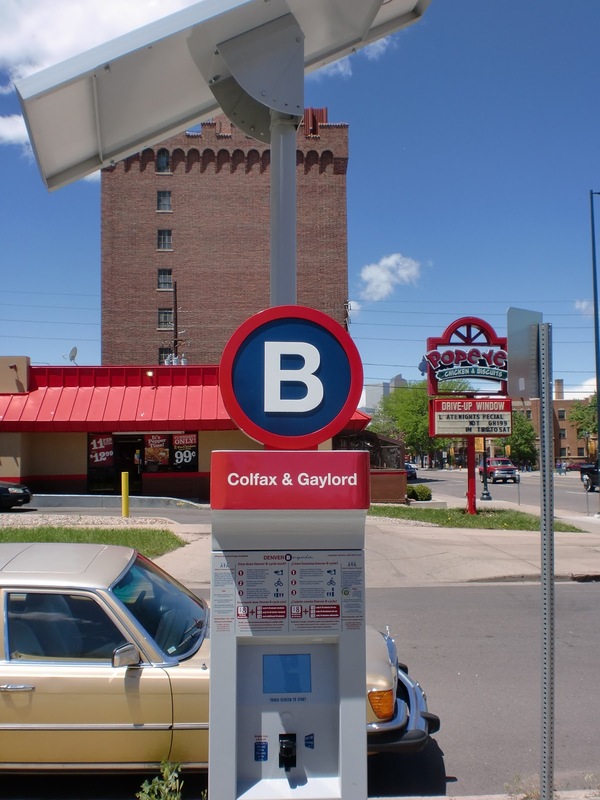 There are two new B-cycle stations on Colfax! 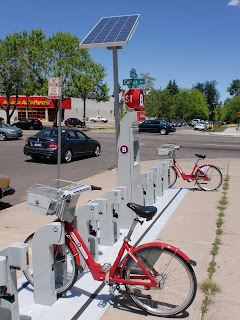 One at Steele (north side) and one at Gaylord (south side). Mark your calendar! The Aurora Arts Festival, Saturday June 29th from Noon-5! Kids art activities, live music, food trucks, beer garden, live theater and free dance classes! Come PLAY in the Aurora Cultural Arts District! suggested. Call 303‐739‐1970 to make reservations. About the Show: The mysterious Willy Wonka is opening his Chocolate Factory for just one day and only five children will be let inside! When Charlie Bucket discovers his lucky golden ticket to take the factory tour, he is swept into a fantastic adventure discovering sweets beyond his wildest imagination! 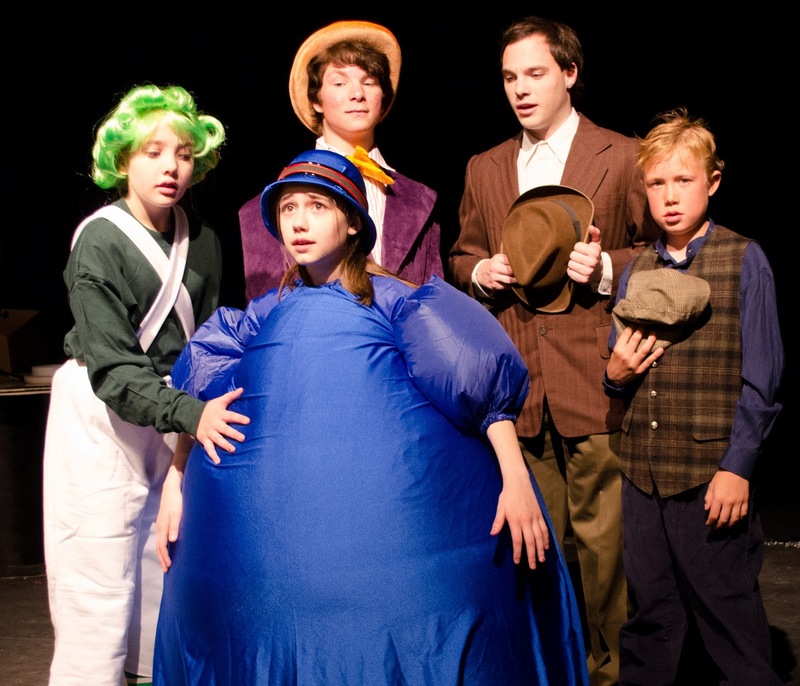 All of your favorite Roald Dahl characters come to life onstage including Augustus Gloop, Violet Beauregarde, Veruca Salt, TV Mike, Grandpa George, Grandma Georgina, Willy Wonka and Charlie himself! 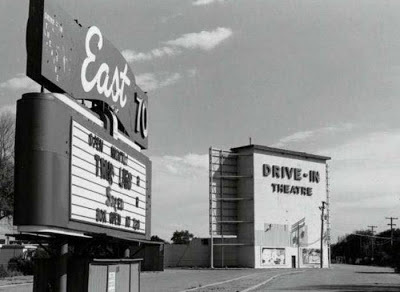 The old East 70 Drive-In Theatre once located at 12800 E. Colfax in Aurora was torn down sometime during the mid '90's. The new Springhill Suites Hotel now occupies part of the site, across from the new Children's Hospital in Aurora. Learn more about the Aurora Cultural Arts District (ACAD) and their future plans in this interview with their new, dynamic managing director, Tracy Weil! 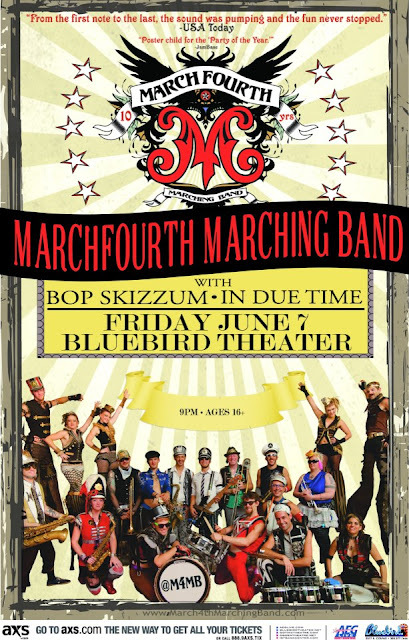 MarchFourth Marching Band at the Bluebird Tonight!! Mod Livin' Modern Furniture (www.modlivin.com), the Denver-based purveyor of modern and mid-century modern home furnishings and accessories, announced their first-time event with Fairfax Wine & Spirits https://www.facebook.com/pages/Fairfax-Wine-and-Spirits-at-Marczyk/246370695386150, Drink & Be Rosy, an evening tasting of over 20 varieties of rosé and wonderful giveaways to benefit Denver's Andre Center. What: Over 20 rosés to taste. Fairfax Wine & Spirits is one of Denver top sellers of rosé wines. How much: Free! A $25 donation is suggested for the Andre Center. Other: Andre Center for Breast Cancer Education and Navigation was recognized in 2012 by Open Media Foundation in Denver and selected for their Independent Voice Web Award. In 2007 and 2008 the founder Sandra Walters was nationally recognized by Yoplait/Susan G Komen/Self Magazine as well as Nursing Spectrum Magazine for the Andre Center's grass roots community outreach efforts." Go to www.andrecenter.com to learn more. 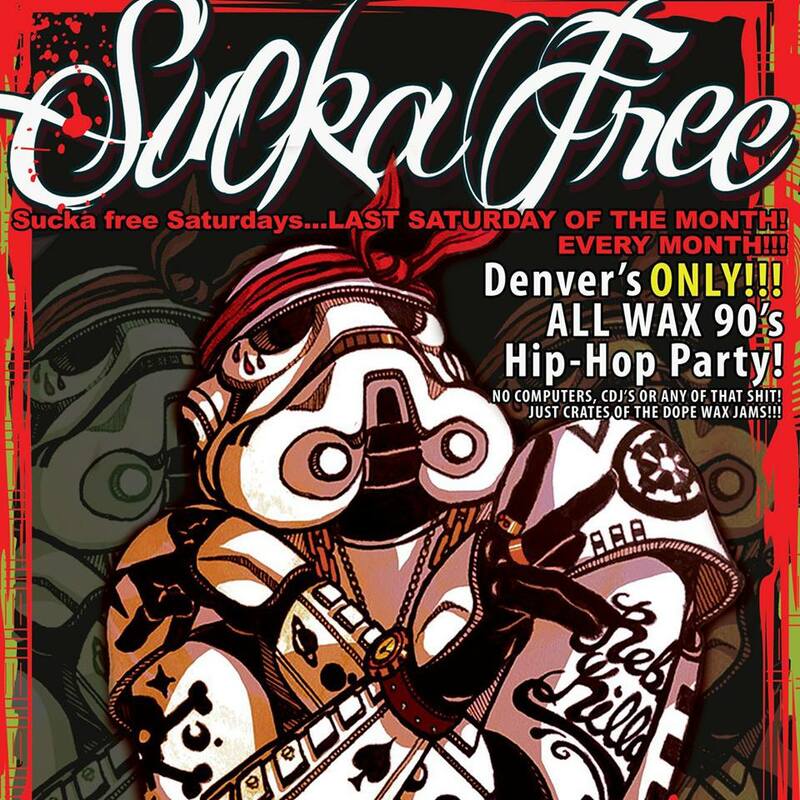 The evening will also include giveaways from Solera Restaurant, MCA Denver, Marczyk, and Mod Livin'. 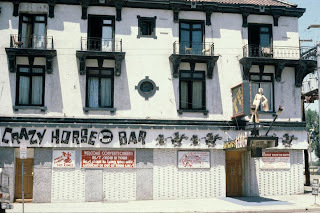 Tricky Dicky's, a 1973 realist painting by Edward Goldman depicting the Colfax (and Clarkson) bar, named after Nixon's win. Wynkoop Brewing Company has just released a special beer brewed in conjunction with James & Tina Pachorek and their Cheeky Monk Belgian Beer Cafés in Denver. The result of nine months of discussions and three months of experimentation, Saison de Colfax is now on tap at the Denver-area Cheeky Monk locations (534 East Colfax Avenue in central Denver and 14694 Orchard Pkwy, suite #700 in Westminster, CO), and the company’s sister bar, Royal Hilltop in Aurora, CO.
It’s also on tap at Wynkoop Brewing Company. Saison de Colfax features the wondrous gifts one expects to find in a saison: vibrant tropical, candy and pepper-spice aromas and flavors in a refreshing Belgian beer. But these typical saison gifts arrive with a tan head and a very subtle chocolate/cocoa note, in an almost opaque beer with a deep brownish-black color. To create the beer, the Pachoreks and marketing director Dona Dalton met with Wynkoop head brewer Andy Brown and Marty Jones to brainstorm target flavors for the finished beer. After collectively deciding on a dark saison style, Brown fermented growlers of a dark wort with six different saison yeast strains. For further research, each of the wort/yeast combinations was fermented at two different temperatures, to gauge the impact of temperature on the yeast’s character. The group decided on a French style of saison yeast. To get a richly colored beer that didn’t taste “dark,” Brown used a roasted wheat malt to provide the beer’s dark hue. 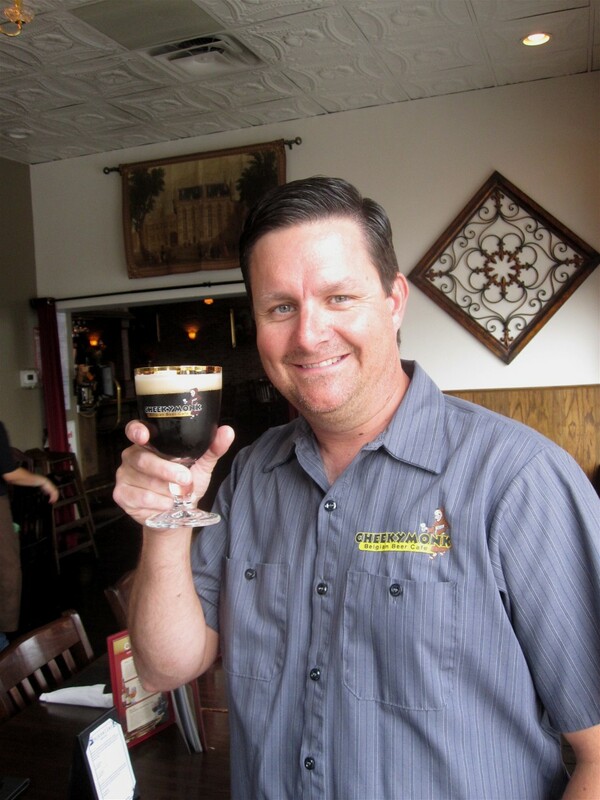 The beer was also made with two-row malt, flaked oats and specialty malts. To accentuate the beer’s yeast character and further brighten up Saison de Colfax, Wynkoop used Saphir and Sorachi Ace hops in the beer. 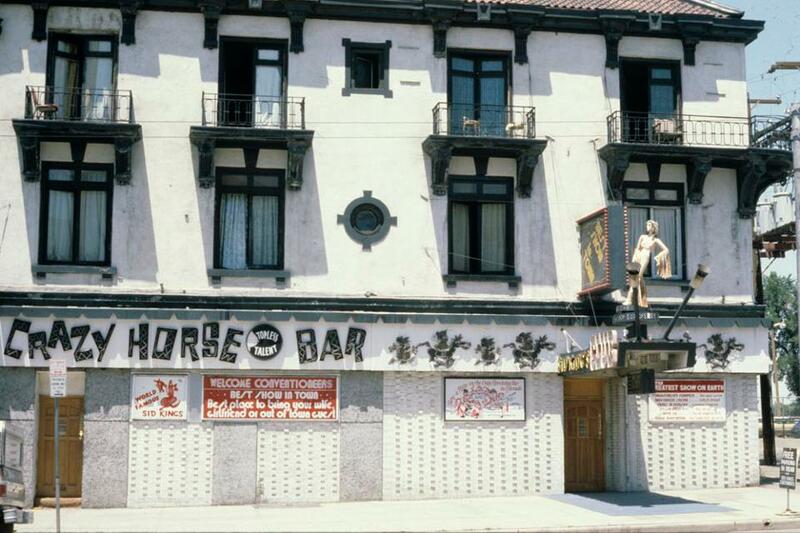 The beer’s name refers to Colfax Avenue, the 26-mile “longest main street in America,” on which the Denver Cheeky Monk location is located. 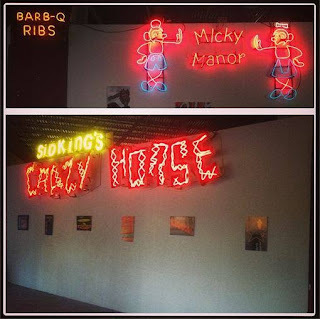 The company’s Lost Highway brewery name also pays tribute to Colfax Avenue (and one of Hank Williams’ best songs). 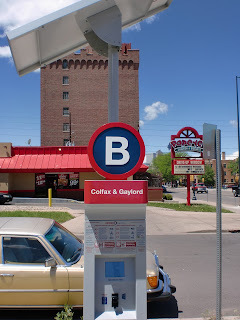 Colfax Avenue stretches from Golden,Colorado, east through the Denver metro area and out to the eastern plains of Colorado. For more information on the Cheeky Monk contact Dona Dalton at 303.579.1433 or ddalton@thecheekymonk.com. Or go to www.thecheekymonk.com. For details on the beer, photos, samples and other info contact Marty Jones at 303-860-7448 (home office), 720-289-9345 (cell) or marty@wynkoop.com or martysjones@att.net . Lakewood's INSPIRE programming kicks off this week, and 40 West Arts is pleased to highlight the Recycled Art Market. 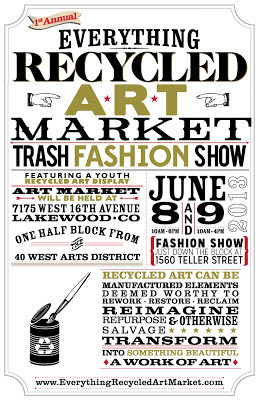 Come discover how green your art collection can be at the first annual Recycled Art Show in Denver on June 8th and 9th. Over 25 recycled artists from the region will be there. The Recycled Art movement has been really taking off in recent years, and offers infinite expressions and remarkable creativity to repurpose old into new and beautiful. 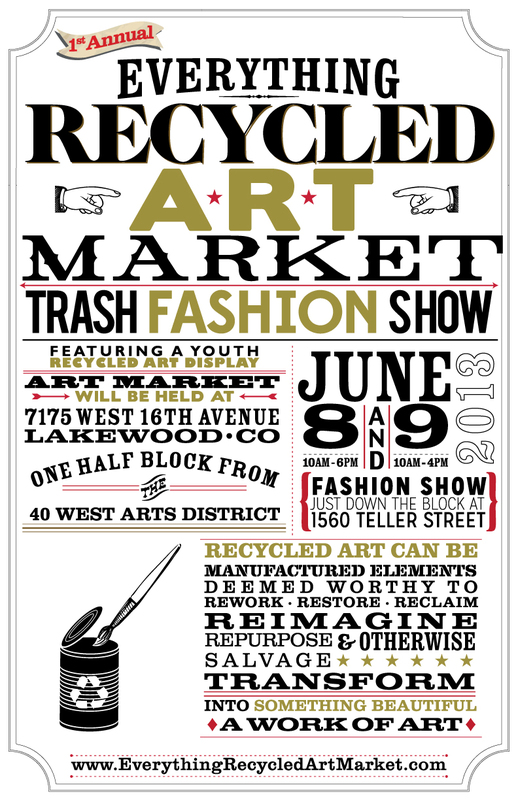 The Everything Recycled Art Market will be held at 7175 W. 16th Avenue, just a block from Colfax, at Teller. $5 admission. There will also be food vendors there. Saturday June 8th, 10am to 6pm. Sunday June 9th, 10am to 4pm. The "Trash Fashion" show will be held at the 40 West Arts Gallery/EDGE theater stage at 1560 Teller at 1pm on Saturday, June 8th. All ages welcome and awards will be given by age group. $5 admission. 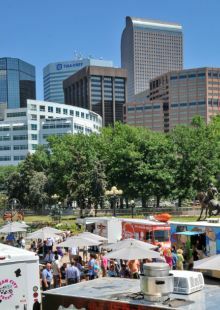 In addition to this art market, there will be an art exhibit at 40 West Gallery 1560 Teller and a range of other activities june 7-11 in the West Colfax Corridor. 826 Sq. Foot Commercial Space for lease at 5345 E. Colfax Avenue. July 1st availability. 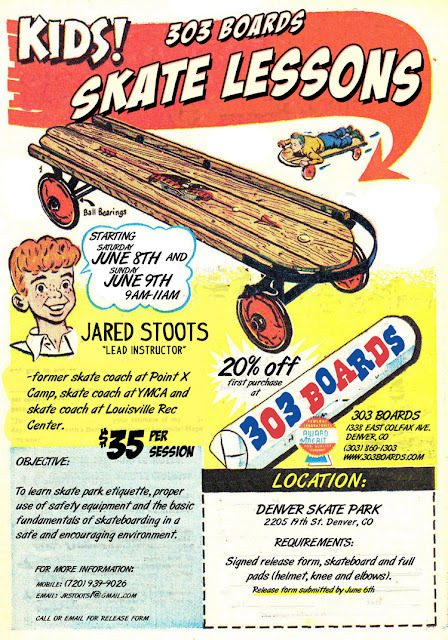 Call Dave Lloyd at (303) 489-3916. 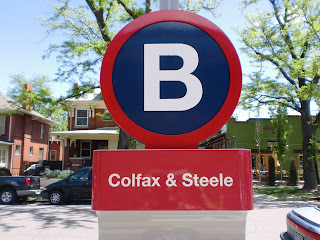 Denver, Co—Four long-time area residents are creating new neighborhood hot spots on Colfax and Filbert Court, across the street from Marczyk Fine Foods. It all started when Park Hill investor John Bachman scooped up the 20,000 square foot site with two buildings shortly after the holidays. 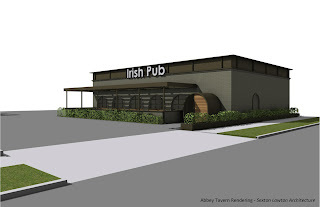 That’s when Andrew Cudden (Park Hill) and Glen Eastwood (West City Park), saw the first “for lease” sign and knew it would be home to their long-planned Irish pub. Cudden owns Emerald Isle Painting, a successful 15 year-old business, and Eastwood managed the popular Fado’s Irish Pub in LoDo. The new 3,000-square-foot Abbey Tavern will open late this fall with a full bar, fresh grill menu and outdoor patio. Next, Bachman marketed a former 1,500-square-foot check cashing business and Park Hill resident Chris O’Sullivan pounced. 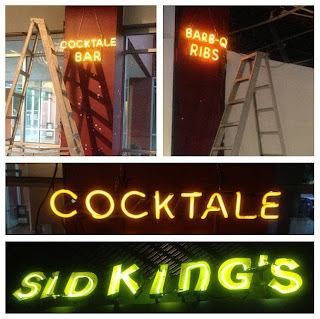 O’Sullivan and his brother Nick own Brother’s BBQ and they plan to open an old fashioned ice cream parlor in the space in early 2014. “I drove by that spot for 12 years thinking about an ice cream shop, and suddenly it all fell into place,” O’Sullivan says. 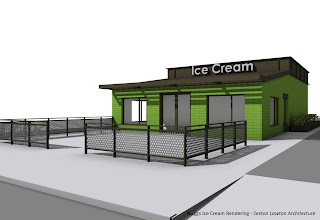 Nuggs Ice Cream will feature homemade ice cream, floats, sundaes, banana splits, pints for sale—all from local Colorado ingredients. O’Sullivan is making sure that everyone is welcome, with bicycle racks, dog hooks and an outdoor patio. 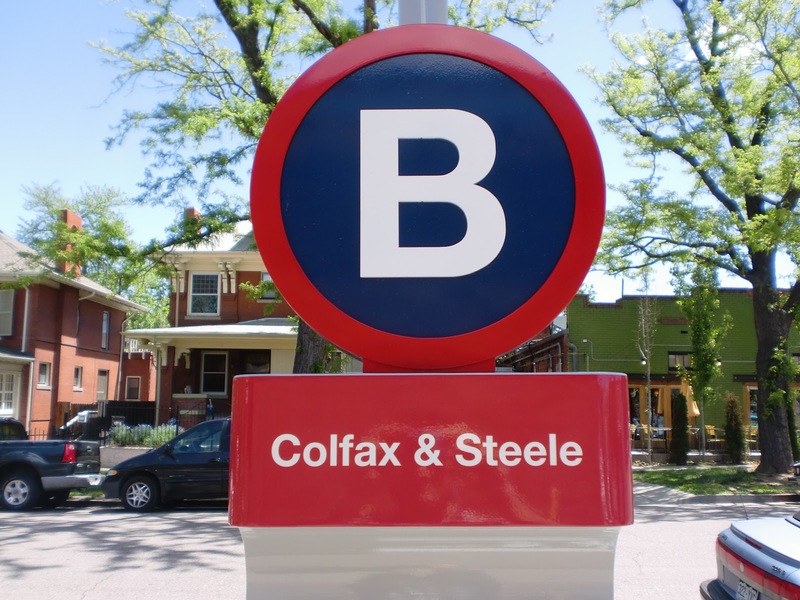 The new businesses also strengthen the mix in the Elm District, a growing neighborhood hub near Elm Street and Colfax. The area now includes the Cork House, Amsterdam Coffee Lounge, Pangaea Salon, Sol Vida Dance, Marczyk’s Fine Foods, Fairfax Wines, The Elm Restaurant, Jet Asian Grill and the Africana Café. Collectively, the new owners are investing approximately $1.2 million in property acquisition and renovations. They’ll create 28 new jobs. In the past several years, Elm District property and business owners have invested approximately $8.75 million in other improvements.